This is what happens when you go to a neighborhood restaurant every other week, usually on a Tuesday or Thursday and always an hour earlier than most other patrons would dream of dining (so the place is empty aside from yourselves) over the course of 3+ years. Both the waiter-manager and the cook smile as if greeting old friends, and they start preparing the kids' usual -- fried chicken and margarita pizza. And when your child mentions that it's your birthday (technically it's tomorrow, but whatever), they go all out -- at the end of the meal, before bringing the check, they switch off the lights and, with candles ablaze, deliver a slide of roll cake with sliced strawberries and "Mommy" written in chocolate on the side of the plate. And then they sing. And the manager takes a picture with his own digital camera. And then asks for your email address. And then emails it to you within the hour. With a message that reads, "Thank you for coming every time!" and "We wish you a HAPPY LIFE!" I love Japan. 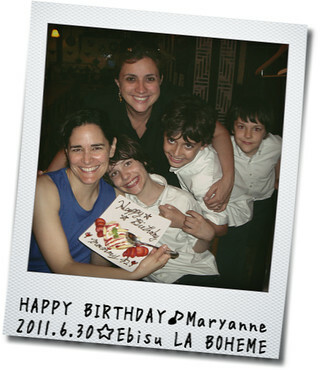 And I will absolutely keep going to La Boheme-Ebisu.